Can TV spot help Tiguan make its mark? Volkswagen sold fewer than 9,000 Tiguans in the crossovers first year, far below a forecast of 20,000 to 25,000 a year. Volkswagen has launched a TV ad campaign to spur demand for its slow-selling Tiguan. In the crossover's first year on the market, VW sold fewer than 9,000 -- well below the forecast of 20,000 to 25,000 a year. Rather than throw more incentives on the Tiguan, VW began advertising the vehicle in national TV spots last week as part of its new "Meet the Volkswagens" campaign. The ads will run through June. VW offers $500 in loyalty cash and 0 percent financing for 36 months, according to Edmunds.com. That is better than the financing deals offered on the segment-leading Honda CR-V. The Tiguan also is covered under VW's 3-year/36-month free scheduled maintenance program. The advertising is long overdue, said one dealer who asked not to be identified. "We had one ad campaign when the car came out, and it was a little weak," he said. "Tiguan is the best-kept secret in the industry -- no one knows about it." Last week, the consultancy AutoPacific gave the Tiguan its vehicle satisfaction award in the mid-sized SUV/crossover category. 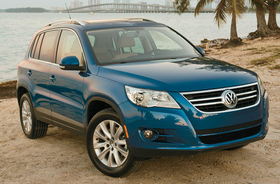 The Insurance Institute for Highway Safety recently named the 2009 Tiguan a top safety pick. Brian Thomas, head of brand marketing for Volkswagen Group of America, said VW needs the Tiguan "to be one of the highest performers in our portfolio." But in today's market, Thomas said, monthly sales of about 1,000 units "are acceptable." With a base price of $23,950 including shipping, the Tiguan is pricier than its major competitors, the CR-V and Toyota RAV4. VW's pricing was affected by the weak dollar against the euro, Thomas said. Honda sold 197,279 CR-Vs last year and the RAV4 137,020 units. The CR-V starts at $21,915 and the RAV4 at $22,300.